Spirulina: An Superfood With More Protein than Chicken! Spirulina: An Superfood With More Protein than Chicken! Spirulina: A Superfood With More Protein than Chicken! I scanned the label of my favourite health food juice, and spotted the usual: apples, bananas and spinach, but then spirulina? What’s that? Well it turns out its an amazing vitamin-rich algae, and before you say “I’m not eating algae”, you should know it has bucket-loads of top-quality protein too! Spirulina is an algae that grows in both salt and fresh water, but regardless of where it grows it needs sunlight and mild temperatures in order to thrive. Spirulina can come in a variety of forms: raw, powdered or even as a pill. It has been produced as a supplement as this superfood is packed with healthy vitamins, beta carotene, and high-quality protein (including the all-important amino acid Leucine). Spirulina is considered a superfood because it’s packed with organic compounds that will help improve both your health and your performance. Beta carotene is the pigment that is responsible for making carrots orange. Therefore you’ll be surprised to hear that Spirulina has ten times more beta carotene than carrots! As a child, you may have been told that you should eat your carrots so you can see in the dark – this isn’t entirely folklore. Your body turns beta carotene into Vitamin A, and vitamin A boosts eye health. So there’s no need to stick to carrots to help maintain perfect vision, as this aquatic plant can also perform the same trick. Protein is an essential nutrient for maintaining and building muscle. You may be surprised to hear that Spirulina is 60% protein – that’s way more than beef or chicken! Before you think “Aaah but it’s incomplete protein from a plant,” you should know that Spirulina is in fact a complete protein with a seriously high Leucine content. Leucine is critical for protein synthesis, the process whereby your body builds muscle (find out more about Leucine HERE). 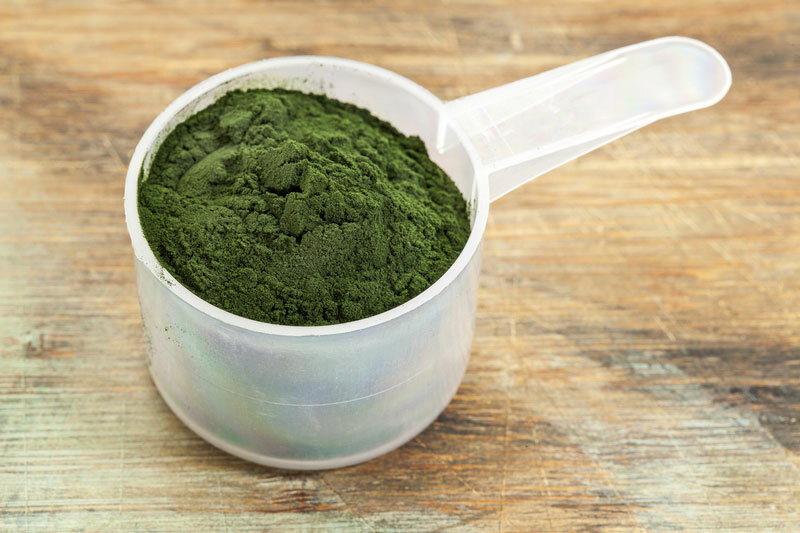 It is usually very difficult for vegetarians to get enough complete protein in order to repair and build muscle, but this algae-based superfood bucks the trend and is a fantastic source of protein to help vegetarians recover and grow. Spirulina is native to Africa and Asia, although it is grown commercially in California and Mexico. Mexico has the largest amounts of Spirulina. Spirulina grows in water. Commercial farms can grow it in controlled conditions or in a natural setting. Always check the label! Avoid buying Spirulina grown in a natural setting, as the risk of contamination by bacteria, microcystins, and heavy metals are higher with this growing practice. Spirulina complements the athlete, gym rat, or bodybuilder. Rid of sugar, chemicals, soy, gluten, and preservatives, it boosts energy and provides nutrients and protein from natural sources. It could also be considered as a supplement for other health benefits, such as for its liver-cleansing and cholesterol-lowering functions. In its powder form, Spirulina can easily be incorporated into any pre- or post-workout shake. In its natural form it can be a delicious accompaniment to seafood or chicken. If I'm not devoting my time to long distance hiking, I'm creating healthy and delicious recipes in my own kitchen. My daily yoga practice contributes to my motivation to lead a healthy lifestyle. Feel free to follow me on Instagram: Madidrag.